Maybe every generation believes that it lives in uniquely interesting and challenging times. The last year seems too to fit the description. European nations that have struggled for centuries to realise their visions of freedom are seeing them disappearing into the rubble of failed neo-liberalism, while nations in the middle east are just beginning that same epic struggle. But while the political and economic rhetoric might change, there is nothing new about any of this. War and revolution, natural disasters, the rising and falling of nations, the inhumanity of the richest and the desperation of the poorest, do not mark us out as any different from the rest. However, there is one area in which we really are outstripping all previous generations, and that is in science and technology. On 13 December 2011, the BBC2 television programme Newsnight devoted considerable time to a story about the Higgs Boson particle, which scientists think may have made an elusive appearance in experiments at the Hadron Collider at the European Organisation for Nuclear Research (Cern) in Geneva. It was impossible not to feel a sense of amazement as images that could have been lifted from Terence Malick’s film The Tree of Life floated across the screen, with a voice-over by the programme's science editor, Susan Watts: "We don't really know why everything around us exists, why the universe has form, why objects have mass. The fundamental question about why we're here remains unanswered. But today's announcement could change all of that." When scientists talk about multiverses, a new cosmology and the meaning of life, they tap into an insatiable source of wonder which is the very essence of our humanity, and we do not have to understand the science to experience a sense of awe about the cosmos of which we are a part. Indeed, today at the furthest frontiers of modern physics, scientists still resort to the same terminology which inspired the earliest Greek philosophers in their reflections on the universe. When Susan Watts talks about existence, form and mass, she could as easily be reading from a pre-Socratic fragment as from a 21st-century science script. But there is an important difference. Those ancient philosophers stood at the very beginning of the western philosophical quest for God, and today popular science has decided to close down that quest by claiming to be on the brink of discovering the answer. This ideological framing is regrettable, because it allows scientific genius to be held hostage by scientific fundamentalism. 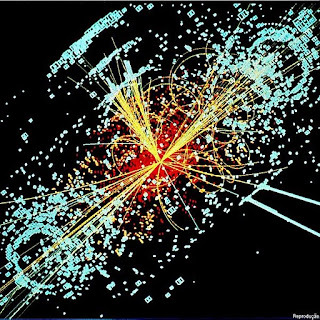 The question of whether or not one has faith in a creator God isn't a scientific question, and Watts is wrong when she suggests that discovery of the Higgs Boson particle could answer "the fundamental question about why we're here". The quest for the Higgs Boson particle has been described many times as the Holy Grail of modern science, but the Holy Grail is a mythical symbol of a quest into the thickets of mystery and longing which make us truly human. Simone Weil once wrote: "In the first legend of the Grail, it is said that the Grail...belongs to the first comer who asks the guardian of the vessel, a king three-quarters paralysed by the most painful wound: 'What are you going through?'" The quest for the Holy Grail is a quest for hope and compassion in a wounded world, beyond all the cures and answers that science can offer. Science has a part to play in that quest, but only when it allows its knowledge to be tempered by wisdom and its genius to be the servant rather than the master of our humanity. To say that is not to diminish in any way the achievements of modern science - it is simply to ask scientists to acknowledge the human limits of what they do. Watts posed the following question: "With each of us facing our daily troubles, and with the world of finance and politics in turmoil all around us, why should it matter whether we find the Higgs, whether neutrinos go faster than the speed of light, if there's some deeper symmetry under the surface or not?" Professor Sergio Bertolucci, Director of Research at CERN, replied that the "very tiny amount of our wealth" invested in such research is an investment in the future, because without "curiosity-driven research ... we are doomed". That word, 'curiosity', is surely the fundamental enigma that science itself will never be able to answer, because science is a consequence of our human curiosity - and a consequence can't study its own cause. It is of the very essence of what it means to be human to experience that curiosity, and to refuse to settle for less than a satisfactory answer. If science ever does provide an answer that satisfies our curiosity, it will do so not by discovering the secrets of the cosmos but by finding some way to manipulate the human brain to eliminate curiosity altogether - and in so doing, it will eliminate our human nature and the condition that makes science possible. The Higgs Boson is not a God particle. It cannot tell us why there is something rather than nothing, it cannot tell us how consciousness is possible, and it cannot explain the curiosity that makes us ask such questions in the first place. But it is a wonder all the same, and something that might indeed make the year 2011 different from all the rest. GK Chesterton once said that "The world will starve not for lack of wonders but for lack of wonder." This has been a year of wonders, but it is wonder itself that makes us human. More interesting than the Higgs Boson which may or may not exist, is the Higgs mechanism, a process by which some bosons gain mass, similar to weight. Tricky business gaining weight (although it's often harder to loose it after mid-winter feasting) but once you have weight (mass) there are no ends of things that you can do with it. As this recent photograph from the Hubble telescope shows, massive things can make stars http://bit.ly/ud476n and stars can make even heavier things, although they may have to die first to do so. Heavier things can be used to make things that live, and evolve. Every atom in a human body - the calcium in bones, the carbon in genes, the iron in blood, was created in a star billions of years ago. After some time these massive humans constructed machines to test theories of the Higgs mechanism. Some theories predict the 'God' particle (the standard model and the minimal supersymmetric standard model) and some don't (technicolor and walking technicolor, funny name because early technicolor theories were modelled on quantum chromodynamics) it doesn't much matter which is right, but it'd be nice to know. So the bosons gained weight, and weighty things made stars, and stars made elements, and elements made us, and we made machines to study how bosons gained weight. You might think that the bosons put us up to this. Just think what those early philosophers could have done with the knowledge that we are born of stars. 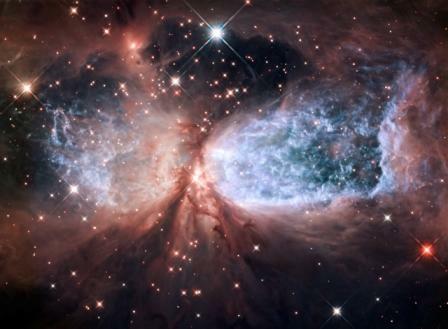 (I've posted the Hubble image above - wondrous, wondrous world).